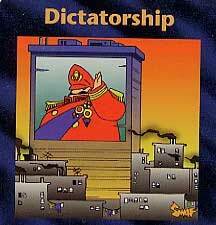 "Would Be Easier If I Were The Dictator"
The wording on this "Dictatorship" Illuminati Card Game card is very revealing. 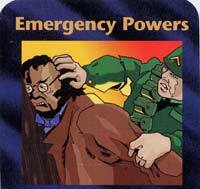 Listen: "Play this card during your turn, on any nation which you control. This is an action for that nation or its master. The target is now a dictatorship. It gets +2 power. It becomes violent, if it was not already." Did you catch the condition of the country which has just gone under the yoke of a dictatorship? "It becomes violent, if it was not already." Keep this in mind as you read President Bush's proposal to impose military control to enforce a quarantine made "necessary" by the Avian Bird Flu. "WASHINGTON -- President George W. Bush, increasingly concerned about a possible avian flu pandemic, revealed Tuesday that any part of the country where the virus breaks out could likely be quarantined and that he is considering using the military to enforce it. 'The best way to deal with a pandemic is to isolate it and keep it isolated in the region in which it begins', he said during a wide-ranging Rose Garden news conference'." The Illuminati has such a great desire to establish military control over this country that they have advanced a number of reasons they would impose such a rule. In addition to proposing that he would use military force to enforce a "quarantine" (read Martial Law with Military Patrol Zones), the President knows that he can impose military patrol zones and Martial Law on the following other grounds, using NORTHCOM as the command structure. 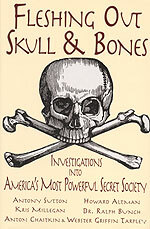 2) If the United States is invaded by aliens -- "More Nuke Rumors - Possible National Security incident in early October"
(NOTE: If a nuclear device is detonated in an American city, you must realize that the perpetrator was the Illuminati, for satellites of both Russia and America have been able to precisely locate every single nuclear device on earth, even those encased in lead. When you read our archived article -- NEWS1938 -- you will realize it is impossible for terrorists to bring a nuclear device into this country and move it anywhere without our satellites detecting it. So precisely can satellites track a warhead being moved, American authorities can see which exit(s) the terrorists are taking as they move down the freeway. Thus, it is manifestly impossible for "terrorists" to maneuver a nuclear device into place anywhere in America). Remember that our government can now legally impose Martial Law upon any portion of the United States for four reasons, as listed above. Keep this in mind, for we shall return to this subject at the very end of this article. Now, let us return to our featured news story. Now, notice how the deliberate "bungling" of the Federal Government through FEMA is playing into the President's hands to get more power. "After the bungled initial federal response to Katrina, Bush suggested putting the Pentagon in charge of search-and-rescue efforts in times of a major terrorist attack or similarly catastrophic natural disaster. He has argued that the armed forces have the ability to quickly mobilize the equipment, manpower and communications capabilities needed in times of crisis. But such a shift could require a change in law, and some in Congress and the states worry it would increase the power of the federal government at the expense of local control." Truer words were never spoken! All the controls and barriers which have served this country so well for over 100 years to prevent a dictatorial government from forming, protections which delegated all matters to the states which the Constitution did not specifically give to the Federal Government. Among those protections was Posse' Comitatus, which forbade the use of regular armed forces against civilians, and today we hear a lot about the President asking Congress to change that law or eliminate it altogether! One newspaper article succinctly stated the obvious reality which would be quickly imposed should President Bush decide to enforce a quarantine with military troops. Read carefully. "After Katrina struck, and TV crews filmed lawlessness on the streets of New Orleans, many Americans demanded that national troops be sent in to restore order ... White House spokesman Scott McClellan said, 'When you have a severe catastrophic event like a Hurricane Katrina, you need to have the authority, a trigger to allow for the military to assume full responsibility for the immediate response in order to stabilize the situation and then step back and let others assume control' ... 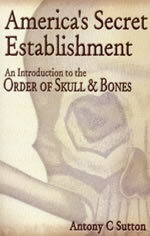 The Posse Comitatus law, passed in 1878, has been modified since then. There are exceptions to the ban on use of federal troops domestically authorized by the Constitution and Congress. The Coast Guard is legally used in the fight against drug smugglers. The Army may give technical assistance to civilian law-enforcement agencies. The Navy may provide planes. And the National Guard is not prohibited from engaging in civilian law enforcement unless it has been federalized by the president. In recent years, military troops have been stationed for patrol in rioting neighborhoods in big cities because that is considered a 'passive' use. Soldiers are not supposed to arrest citizens, which is considered an 'active' use of the military ... Now the debate has gone public, and there is no partisan consensus." The first steps of the Six-Step Attitudinal Change Plan have now been implemented. The President has officially proposed that he be allowed to immediately send in military forces to deal with massive destruction like that caused by Hurricane Katrina. One can only assume he would do this after he Federalized the National Guard, thus taking control of those forces from the governor of the affected state(s). Posse Comitatus has served as a bulwark against Federal military control, a prospect which has terrified Conservatives since the days of Franklin D. Roosevelt. Now, President Bush is proposing that such bulwark protection be abolished or watered down so badly as to be ineffective. Truly, our liberties are under attack as never before in American history. But, there is more to this story than meets the eye. 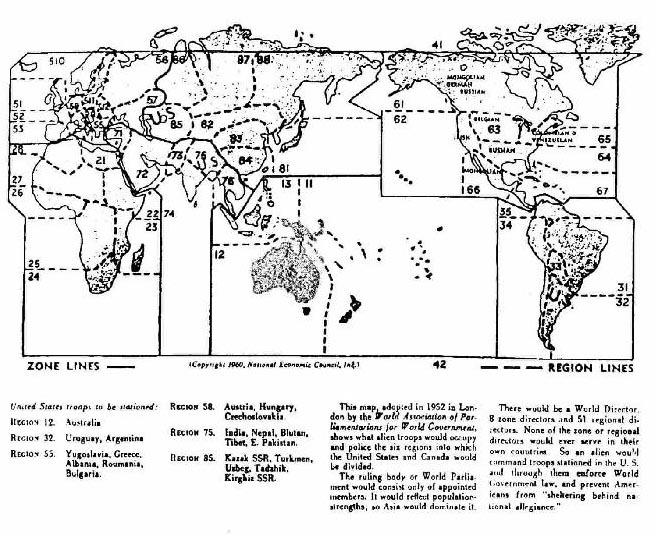 Look carefully at this map, created during the 1952 Bilderberger Meeting. 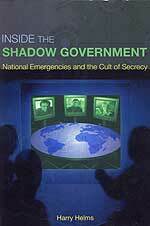 Notice that all sovereign nations of the world have been divided into individual military patrol zones. Then, notice that each formerly sovereign nation of the world is going to be ruled by foreign troops! America is to be divided into five military patrol zones. Let us now examine the troops that are to be stationed in North America according to this 1952 plan. 2. Southern America all the way to California -- Russian troops. The line begins at Virginia and goes straight West to the border of California. 6. Mexico -- Mongolian [Chinese] troops. Notice that this zone extends northward into California to include Los Angeles. Foreign troops would be in total control of the entire North American continent. No sizeable American troops would be allowed in this country. Then, what needs to happen to the 1,146,959 American troops that used to be stationed in this country? They will either have to be disbanded or deployed overseas. Since the days of President Clinton, American troops have continually been sent overseas. Today, American G.I. 's are stationed in over 120 spots throughout the world, in addition to being tied down in Afghanistan and Iraq. Our military is truly stretched very thin. Let us go back for a moment to the Raiders Updates article, above, to address this very problem. "Today, Americans would be outraged if U.N. forces entered Los Angeles to restore order. Tomorrow, they will be greeted." A more succinct statement of this part of the New World Order Plan is not possible! Henry Kissinger has just stated the full and complete Plan for his listeners, but since most Americans do not know this part of the Plan, Kissinger's remarks flew right above the heads of most. Do not be deceived: the United States is not only going to voluntarily give up its sovereignty, its leadership is going to voluntarily allow foreign troops to enter so as to impose military rule! Foreign troops are planned to patrol America once the military patrol zones have been set up to combat the deliberately created crises gripping the country. Since Cutting Edge has known this for years, our only question was under what conditions would they be introduced? And, which foreign troops would be the first to arrive? One thing is certain: once the first foreign troops are invited on to American soil, and actually are deployed here, discerning Americans should know with certainty that the final parts of the plan are very close to being implemented. Listen to the following news story which reported that elite Dutch and Mexican marines landed in Texas following Hurricane Katrina. "Sep. 9--ONBOARD THE ARM PAPALOAPAN -- - The Marines have landed in Biloxi -- the Mexican Marines. And Dutch Marines as well. For the first time since the 19th Century, Mexican troops landed Friday on U.S. soil, sent from the Mexican Navy ship ARM Papaloapan anchored near the USS Bataan. The Mexican ship's name means, 'River of Butterflies'. Marines from Mexico, Holland and the U.S. are part of an international Hurricane Katrina cleanup effort building up on ships about 20 miles offshore in the Gulf of Mexico. Four Canadian ships are on the way." Foreign troops are here, in response to a natural disaster caused by Hurricane Katrina, which we know was created and steered by Scalar Electromagnetic Wave technology and which contained a very strong "occult signature". 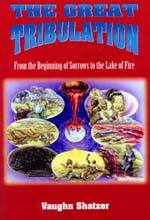 Therefore, we know America has entered into a final stage toward the completion of this long-term Illuminati plan. Now, let us return to the beginning portion of this article to pose the final question. We noted that Martial Law can now be declared according to any one of four (4) scenarios. Why would our leaders create four different scenarios by which they can legally impose Martial Law? Any one of these disasters would seem sufficient to clamp down Martial Law throughout the country. 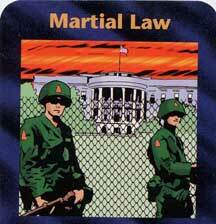 However, upon certain review, maybe Martial Law is not planned to be clamped down all across the country all at once. 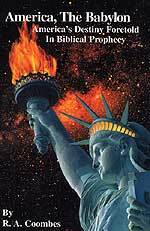 American patriots had always considered that nationwide Martial Law would be imposed all at once, with one disaster causing it. 1) West Coast might have Martial Law imposed because the third "prediction" of FEMA (major earthquake on the San Andreas Fault) had just occurred. Perhaps Martial Law might be declared in California and nearby Nevada and Utah. At this point, the rest of the country would not be under Martial Law. 2) If Oregon were to suffer a tidal wave (NEWS2076), the states of Oregon and Washington could be brought into Martial Law. At this point, only California, Utah, Nevada, and the Pacific Northwest would be under military rule; the rest of the country would not be under Martial Law. 3) If the area around the CDC laboratories -- which recreated the deadly Spanish Flu in 2003 -- were to suddenly suffer an outbreak of Avian Bird Flu, Martial Law could be declared in the Southeast. At this point, the Southeast, the Southwest and the Northwest could be under Martial Law, while the rest of the country is not -- yet. 4) If an atomic device is set off in New York City, the entire northern portion of the East Coast could be declared under Martial Law. After all, radioactivity could be declared a danger from Washington, DC, to Maine. People will believe it, since few of them would ever check to see if radioactivity would really spread that far. 5) If aliens land in Denver and/or Chicago, Martial Law could be declared in the northern middle section of the country. According to this proposed scenario, Martial Law might be declared piecemeal, not all at once. This strategy might defuse any attempt by patriots groups to take their 100 million guns to the streets to oppose the government takeover. From 1933-1939, Adolf Hitler faced the danger of organized militiamen -- veterans of World War I -- who had committed themselves to militarily oppose any attempt by Hitler to impose nationwide dictatorship; therefore, Adolf carefully took piecemeal steps, none of which alarmed the militia groups so much that they sprang into action. In fact, that time of action never came and Hitler took dictatorial powers without any significant opposition from the veteran German militia leaders. Might we see the same scenario unfolding here? Yes, we just might, and that may be the reason we have at least 4 different scenarios which could trigger the imposition of Martial Law. Clearly, though, America has slipped into the last stages of this military dictatorship plan, which is why we are continually.